Marjory Stoneman Douglas High School in Florida is due to resume classes on Wednesday after a gunman killed 17 people at the school two weeks ago. The killing which left students and teachers traumatised was one of the deadliest U.S. mass shootings ever. Marjory Stoneman Douglas High School in the affluent Fort Lauderdale suburb of Parkland, was scheduled to reopen its doors at 7:40 a.m. local time for a half-day schedule. The building where most people died would remain closed indefinitely. State legislators are considering a bill that would pay to demolish Building 12, widely known as the freshman building, and replace it with a memorial to the victims of the Feb. 14 massacre. Teenage survivors of the carnage have launched an extraordinary student-led campaign to lobby lawmakers on Capitol Hill and the statehouse in Tallahassee for new restrictions on firearms. But many express deep trepidation about returning to the scene of a shooting rampage that ranks as the second-deadliest act of gun violence at an American public school. “It’s just really hard to think about,” David Hogg, a senior who has become one of the school’s leading gun-safety activists, told NBC News on Tuesday. As surviving students face a daunting return to the hallways and classrooms where classmates and teachers died, Cruz was due back in court on Wednesday for a hearing to determine whether he has the assets to pay for his own defense. His mother died in November. He is accused of carrying out the shooting rampage with a semiautomatic AR-15-style assault weapon that he legally purchased from a licensed gun dealer last year, when he was 18 years of age. 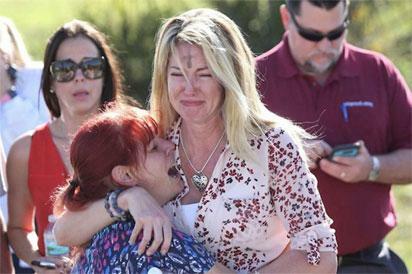 The post Massacre : High school in Florida to resume classes appeared first on Vanguard News.